Tucked away in a wooded valley hidden between vast cornfields sits Dutton’s Cave. Its short, wide mouth yawns open at the base of a high rock cliff, and a small spring trickles into a creek just before the entrance. I explored the cave about a decade go, finding a large cavern just inside and a tall cathedral room a bit further back. These days, Dutton’s Cave is off limits. Conservation officials closed it in 2010 because of concerns over spreading white-nose syndrome, a fungus-based condition that can wake hibernating bats to fatal results. The fear is that people will unwittingly carrying the fungus from one cave to another on the bottom of their shoes. During a recent trip, I found the cave blocked at a bridge just short of the entrance. Park officials have found signs of white-nose syndrome in more areas of Mammoth Cave in Kentucky. The disease was first noticed in 2013, but the new areas are along the tour routes. This is a concern because of the possibility of humans carrying the illness to other caves through their footwear and clothing. MAMMOTH CAVE, Ky. — White-Nose Syndrome, a disease that is deadly to bats, has been found to be present along the toured passageways of Mammoth Cave, according to National Park Service officials. Park staff discovered WNS in remote sections of Mammoth Cave last year, including colonial hibernacula. 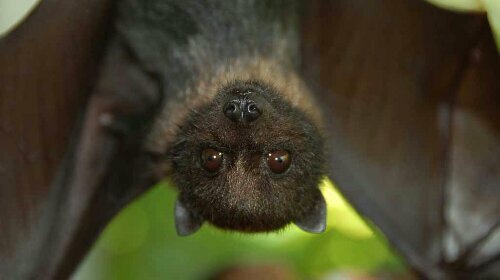 WNS was first detected in New York State in 2006 and has killed millions of cave-dwelling bats in eastern North America. As the disease progresses, bats become active during months when they would normally be in hibernation. Mortality rates of bats have reached almost 100 percent in multi-year infected caves. Tours and research are continuing at Mammoth Cave National Park, accompanied by extensive education and outreach on WNS, and adherence to approved cleaning methods recommended by U.S. Fish and Wildlife Service. Visitors must walk through bio-security mats as they exit cave tours. Here’s a curious smuggling case, but the question that hasn’t been answered is what was a Northern Mariana Islands senator trying to do when he hid eight dead fahini fruit bats in 40 pounds of lemons? Sen. Juan Manglona Ayuyu recently pleading guilty to conspiring to violate federal wildlife trafficking laws by sneaking the endangered bat carcasses into a plane bound for Saipan and to allegedly trying to get a witness to throw off the grand jury investigation, according to court records. The indictment below has some of the details. But there is no indication if the bats were hunting trophies or were intended to be part of a meal. According to the U.S. Fish and Wildlife Service, fanihi have been consumed by humans since they first inhabited the area, and eating the bat “represents a significant cultural tradition.” Hunting the flying rodent has been illegal on the islands since the 1970s. More on the bats here. Great Smoky Mountains National Park wildlife staff recently received numerous reports of unusual winter bat activity. Normally, bats should be hibernating during the winter, but bats have been described as flying erratically during the day and diving down toward people. Park biologists do not know the exact cause of this unusual bat activity, but urge all visitors to exercise caution as bats are known to carry diseases such as rabies. Skin to skin contact should be avoided. According to the Centers for Disease Control and Prevention, the transmission of rabies virus can occur from minor, seemingly unimportant, or unrecognized bites from bats. For human safety, it is important not to touch or handle a bat. The Department of Health and Human Services recommends you seek immediate medical advice if you have had skin to skin exposure to a bat. The park is home to at least 11 species of bats that play a critical role in the health of ecosystems by consuming insects including mosquitoes and agricultural insect pests. One of the species in the park, the Indiana bat, is federally endangered and another, the Rafinesque’s big-eared bat, is a state listed species of concern in both Tennessee and North Carolina. If you see a bat or any other wild animal that is acting strange and you suspect it may be sick or injured, avoid the animal and contact Park Communications. Unusual bat activity outside the park should be reported to state wildlife agencies. MAQUOKETA, Iowa – Wildlife officials have detected the fungus that causes white-nose syndrome for the first time in a cave at Maquoketa Caves State Park. The caves recently reopened this spring after being closed for years because of concerns over the syndrome, which can be fatal in bats. But the recent discovery apparently isn’t linked to the reopening. Officials with the Iowa Department of Natural Resources said efforts to prevent the spread of a fungus will be stepped up after a low level was detected on a hibernating big brown bat. The detection of the fungus came from a swab taken during sampling on the hibernating bats in March, DNR officials said. This was about one month before the caves were reopened in April. The testing is used to detect DNA that would indicate the presence of the fungus that causes white-nose syndrome, which has been deadly for bats particularly in the northeastern portions of the United States and Canada. The testing was done as part of a national study being conducted in an effort to stop the spread of the disease. A total of 15 bats were swabbed at Dancehall Cave, which is one of the largest caves in the park and features a paved walkway, with the very low level of the fungus detected on only one bat. 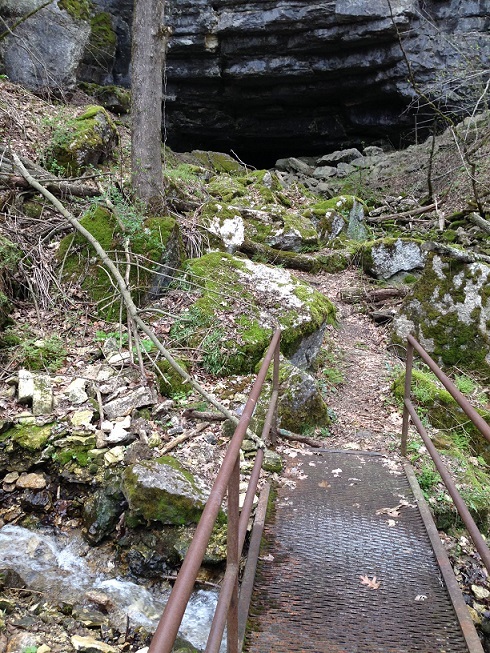 But Howell said even the small detection of the fungus changes the dynamics at Maquoketa Caves State Park. “We now go from trying to prevent the fungus from getting into the cave to trying to prevent it from getting out,” Howell said. To that end, the DNR will add mats with disinfection solution that people will walk across after leaving the caves to decrease the potential of spreading the fungus to other caves and bat populations. People who have recently visited other caves will also walk across the disinfection mats prior to going into Maquoketa Caves. The DNR also will have staff available at the caves to provide information to visitors on how to prevent the spread of the fungus. After participating in the educational program, cave visitors are provided a wristband. So far this year, more than 10,000 wristbands have been given out. “Education is probably the most effective tool we have to prevent the spread of the disease,” said Kevin Szcodronski, chief of the state parks bureau. The park’s caves were closed for two years because of concerns about white-nose syndrome and the approximately 400 bats that hibernate there in the winter. The caves were reopened this spring because the DNR was able to have staff available to educate the public about precautions needed to prevent spreading of the disease.